We are a distinguished manufacturer's representatives/Distributors of RF & Microwave Components. The items offered by us are manufactured in compliance with industry standards and find application in the communications and aerospace sectors. RLC Electronics' Terminated Multi-Position Coaxial Switch line provides proven reliability, long life and outstanding electrical performance and features extremely low insertion loss and VSWR over the entire DC-18 GHz range, with an option to 26 and 40 GHz while maintaining high isolation. (Failsafe): 12Vdc at 600 ma nom. 28Vdc at 260 ma nom. 115Vac at 40 ma nom. (Latching): 12 Vdc at 480ma nom. 28Vdc at 240ma nom. 115 Vac at 225 ma nom. Cutthroat circuitry (standard), recovery time 100ms nom. Switching Sequence: Break before make. 1: "M" for Manual, "R" for Remote. 4: "I" for indicators if desired. 7: "26" for 26.5 GHz options. MWF204-P multiplexer fiber modem can transmit four RS-232/RS-485/422 signal full-in-one multi fiber optic line. RS-232 get 3 lines;RS-485/422 support multiplexer(128 nodes)4 ways baud rate, auto-fitting. Ÿ Convert RS_232/RS_485/422 ,full duplex, semi duplex communication Ÿ Serial port is connect as RJ45 Ÿ unique serial port protection electrocution, support hot_swap Ÿ Built _in intelligent module, auto_recognize RS-485 signal , no need CTS control Ÿ 600w/ms Lightning protection ,15kv static protection Ÿ Transparent transfer, baud rate adaptive , no need change protocol Ÿ Industrial grade design , import component. RLC Electronics' miniature surface mount coaxial switch is a single pole two position type. The switch provides extremely high reliability, long life, and excellent electrical performance characteristics in a miniature package. The power consumption is approximately one half that of the miniature connectorized switches. The switch is available with a choice of four different operating frequencies, three coil voltages, and two different pin configurations. RLC Electronics' High Power Coaxial Switch is a single pole, two position type providing extremely high reliability, long life and excellent electrical performance over the frequency range of DC-6 GHz. The switches will handle 2000 Watts at 100 MHz to 400 Watts at 6 GHz. The switches utilize thermally conductive, dielectric insulators to allow high power handling capabilities. The package utilizes high density packaging techniques, volume of the switch is less than 6 cubic inches. RLC Electronics' High Pass Cable Filters combine the excellent response of our F-90 series filters with the mechanical flexibility of formed semi-rigid cable(s). RLC Electronics' Tubular Band Pass Filters are designed for operation over the frequency range of 15MHz to 8.0 GHz. These fixed tuned filters are constructed utilizing 2 to 12 sections with 3 dB bandwidths of 2 to 60% of center frequency. These filters utilize direct coupled sections. 5 "N" for type N, "B" for BNC, "T" for TNC, "R" for SMA. BPF-250 is available with only SMA. Add "M" or "F" for two male or female. RLC Electronics' Broadband Miniature Attenuators offer precision impedance matching and bi-directional handling over the extremely broad frequency of DC to 18 GHz. They are also available in the reduced frequency ranges of DC to 12.4 GHz, DC to 8 GHz and DC to 1.5GHz. These miniature microwave structures are uniquely constructed resistive film elements combined with precision connectors meeting the full requirements of MIL-C39012. Units can be supplied in standard attenuation values as listed or other values for specific requirements. Three combinations of connectors are available in the standard models. RLC Electronics' VHF Switch Attenuator Model AS-120 is a "rocker switch" RF attenuator designed to operate over the frequency range from DC to 1.5 GHz. 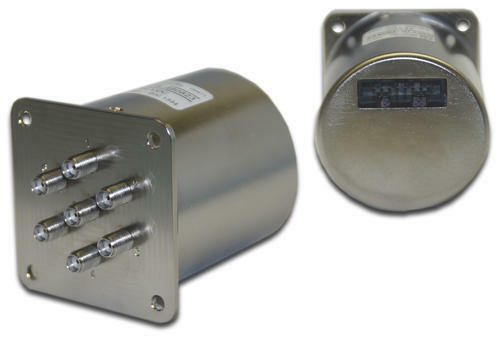 Attenuation from 1 to 101dB in 1 dB steps is provided by switching individually controlled attenuators connected in series. The total attenuation is the sum of those steps switched to the "in" position. These attenuators have excellent performance characteristics suitable for use in high reliability 50 ohm systems, and are highly repeatable. Attenuation can be easily seen by a quick glance at the rocker positions showing which attenuation values are in the circuit. Power Rating: 2 watts average @ 25C. 200 W peak @ 25C. RLC Electronics' PA Series Attenuators are binary Programmable Step attenuators designed to operate from DC to 18 GHz. Two basic models offer attenuation ranges of 15, and 70 dB. Control is in standard format: 1-2-4-8, etc. The attenuators are available with fail safe or latching operation, 12 or 28 volt coils, optional TTL drivers, and a choice of frequency ranges. Switching Speed: 15 milliseconds max. RLC Electronics' Series D-05180 (0.5-18 GHz) power dividers have high isolation, small size, and superior performance in a single package. With today's most advanced technology in CAD/CAM equipment & precision etching, complex multi-section designs have been developed using original analysis of micro strip theory. RLC Electronics' D--1814A is a broadband DC to 18 GHz resistive power splitter which utilize two resistors, one on each of the output ports, and is a unidirectional device. It provides exceptional amplitude tracking and a very low equivalent output VSWR over the whole frequency range. It can be used in applications in which one of the two outputs is included in a leveling loop as a reference in a ratio system. RLC Electronics' broadband resistive power dividers are small and lightweight with stainless steel `SMA' connectors. They have excellent stability over temperature and output power, symmetry over frequency with a division of 6dB from matched ports. Input and outputs are interchangeable and phase difference is nominally 2.5 Degrees between output ports. These dividers utilize 3 resistors to provide excellent output VSWR at the auxiliary arms over the full frequency range enabling wide band measurements to be made accurately. RLC ELECTRONICS' Surface Mount Power Dividers combine the characteristics of a Wilkinson divider in a compact true surface mount package. Currently both two and four way designs are available with a frequency range extending from 0.5 to 2 GHz and still maintain excellent electrical performance. RLC Electronics' Miniature 3 dB 90 Hybrid Couplers offer superior performance over the frequency range of 500 MHz to 12.4 GHz. These devices exhibit exceedingly high isolation with low VSWR. Strip line construction incorporating precision etching and tightly controlled material tolerances, ensures extraordinary reproducibility of electrical parameters as well as excellent phase and amplitude tracking. All units are packaged in lightweight solid aluminum cases with convenient mounting holes. Broadband Directional Coupler provide the ultimate in flat coupling and high directivity over the 2 to 18 GHz band. These miniaturized units are ideal where stringent wide band specifications must be maintained. RLC Electronics' miniature surface mount transfer switch combines high performance in a compact configuration. The switch provides extremely high reliability, long life, and excellent electrical performance characteristics in a miniature package. The power consumption is less than half that of the miniature connectorized switches. The switch is available with a choice of four different operating frequencies and three coil voltages. Switching Time: 15 milliseconds max. Operating Mode: Failsafe or latching. RLC Electronics' DLF Series Power Dividers/Combiners covers a wide frequency range of 10 to 500 MHz, using unique lumped element designs to achieve the wide bandwidth. They are housed in a convenient low profile (0.4 inch) SMA or Pin package. 1: -2 for 2-way, -3 for 3way, etc. 2: R for SMA female or P for pins. Power Dividers are compact micro strip units with wide bandwidth and multiple outputs. These units provide low VSWR at all ports and high isolation between all the output ports. Phase and amplitude tracking of all outputs are excellent due to the symmetrical designs. Combinations of two-way and three-way power dividers in one package forms the basic building blocks in a variety of custom or standard "N" way output ports.